It is currently 9:53 p.m. Friday night. I post this menu at midnight. That means I have 2 hours and 10 minutes, to finish this post, watch the season finale of my NEW favourite television show, write an episode of the show I write and voice, My House Your Money AND eat both a bowl of ice cream and a bowl of Party Mix (heavy on the ringalos) and do 2 hours worth of Crossfit. Just kidding. As if on the Crossfit. You’re gettin’ screwed out of any entertainment value in this post whatsoever. 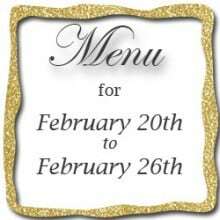 You are getting a menu so be thankful for that. 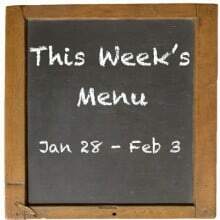 Hmm … not a lot of recipe links for you this week. Sorry. For what it’s worth the method I use for cooking the Kale with peanut sauce and some matchstick cut carrots IS from the Crossfit Weekly mean meal plan. So. That’s pretty much like a couple hours of Crossfit. Without the vomiting at the end of it. Farm Girl, it is perfectly acceptable to finish the entire jar of jam as long as you eat equal portions of COOKIE BUTTER from Trader Joe’s also right out of the jar with forementioned spoon…. When will we know what time to be at Betty’s? When do you want to tell us about the program you write and voice? Well, I guess I can get the low down when I see you at Betty’s, right? Aren’t those left over chicken burgers getting kind of old to be feeding to the fella? That was mid-week when you made them during that wonderful tutorial, remember? Just trying to take care of my guy just in case. Well, I guess technically he is still yours but I’m working on a plan. LOL I hope he likes a lot of pets running around the house. I was going to keep that a secret but you tricked me in to telling you about them, Darn! Gayla T – The chicken burgers are the ones I froze. The show is My House Your Money and you can see it on HGTV in your neck of the woods. The fella only likes well behaved dogs and cats frighten him. We had an attack cat once. ~ karen! Hope you have a great weekend too! Will we see each other on the Secret Garden Tour Sunday? Nothing like being legal peeping tom’s and paying for it! :-)! I’m going to be going to therapy ….trying to get over not being picked for the Dill Chip Giveaway….and having to walk so far to get some. :-)…..xo! “the crossfit mean plan”!!!!!!!! from what you’ve said about crossift, the mean plan sounds like a better description than meal plan…. I love you & your guys…..
How was the ginger butternut squash soup last week? Do you have the recipe? I wasn’t posted at the time and I’m drooling to have a shot at it! I often have the dirty ol crumbs from my cutlery drawer! LOLOL …..You TOTALLY crack me UP! 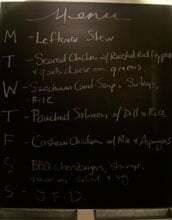 Still not as organized as you but the weekly menu plan does motivate me to think of a few possibilities and perhaps pick up groceries ahead of time. Super cool about the t.v. show. Looking forward to checking it out more closely. Hey Kelly – I’ve actually been writing and voicing this particular show for 2 seasons. My House Your Money is on the W network in Canada and HGTV in the States. ~ karen! Made the no-knead bread, waited for it to cool (ok so waited 10 minutes–whatever!) slathered on the new Land O Lakes olive oil and sea salt butter, and filled my belly. Good stuff! Love te chicken burger recipe,too. Thanks for posting your menus. I love to cook, and your menus keep me inspired. And what time are we meeting at Betty’s? I’ll bring guacamole and fresh salsa! DonnaBoo – Thanks. Hrumph. Every time I decide to stop posting my menus, someone leaves a comment like yours. Hrumph. ~ karen! 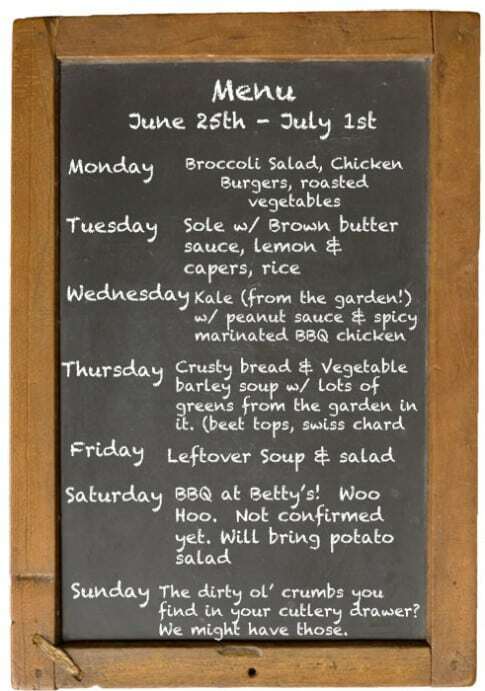 your killing me with sunday’s menu 😉 too funny! 2 hours of CrossFit…that seems a little much. I’ve been hearing more and more about Kale and peanut sauce…I’ll have to try it. Michaela – I was kidding on the Crossfit. Although, if you’ve ever met a Crossfitter you know that 2 hours isn’t out of the ordinary at all. In fact 2 hours leans on the conservative side. ~ karen! Hi Karen…Thanks for your wonderful menus. I’m always inspired by them. I’ve been trying to work kale into our menus recently. I’ve tried baked kale chips and sauteed kale with olive oil, garlic, chili pepper flakes, and salt and pepper. My guy dutifully ate both of these variations on kale, but he wasn’t thrilled with them. How do you do your kale with peanut sauce? Do you saute it and then dress it with the sauce? And is the sauce from a bottle, or homemade? I’d love to find a way to make kale so that it would become a favorite at our house like my roasted asparagus with olive and garlic salt has become. Thanks again. Thank you, Karen! I’m going to try that for dinner later this week! I don’t know if we can find the same brand of peanut sauce in our grocery here, but we’ll use whatever we can find. It sounds really yummy to me, and I love the idea of including matchstick-cut carrots with the kale. Thank you!